This article was co-authored with Alex Tapscott. In this CoinDesk 2016 in Review special feature, Don and his son Alex chart a broad overview of blockchain in 2016, with an eye to what is to come in the year ahead. Notably, they argue that 2016 was the most important year for the tech since the debut of Satoshi Nakamoto's bitcoin white paper. 2016 was a critical year, the most important since Satoshi Nakamoto published "Bitcoin: A Peer-to-Peer Electronic Cash System" in 2008. When we wrote "Blockchain Revolution", many were speculating on what this technology could achieve. We did our best to capture those possibilities - for the economy, government, and society -and have been surprised by the breadth of innovation underway. For example, central banks have emerged as powerful forces in the future of cryptocurrencies and are gaining momentum. The Bank of England and others are already exploring blockchain-enabled fiat currencies to reduce friction, cost, and risk, increase transparency and accountability, and improve oversight of the financial system. Healthcare has emerged, in earnest, as one of the most exciting areas. Companies are working to unclog bottlenecks in the system, from clinical trial data to personal health records. 2016 was the year that many bank CEOs woke up to both the threat and the opportunity of the blockchain. At a meeting of 50 CEOs of the 50 largest banks back in January, most were skeptical. Now most are investigating how this technology might transform their companies and industry services. We wrote about the blockchain as the big enabler for reimagining every aspect of the industry - from payments to investment banking, insurance and accounting. Some observers have been surprised to see banks opening to blockchain when they've not typically been hotbeds of technology innovation. What's driving this growing interest is the blockchain's once-in-a-generation potential for fixing problems, improving efficiencies and reducing risk - and disintermediating incumbents in the process. The departure of several large financial institutions from the R3 blockchain consortium is not surprising. We would expect such a large group of institutions to face some collaborative challenges: many of them are competitors, each at different levels of development in different areas of the business. Consortia will be critical to reinventing financial services and other industries. To effect change, they need well defined goals with tangible objectives. If anything, the shake-up is a sign of a maturing industry. When it comes to blockchain investment, the money keeps flowing! 2016 was a major year for investment, with $387m being directed into blockchain startups. But the nature of these investments has shifted. From 2012 to 2014, primarily venture capitalists were funding business-to-consumer bitcoin-enabled solutions for common banking problems such as cross-border money transfer or retail payments. In 2015 and 2016, we saw money flowing into private blockchain opportunities addressing corporate issues, from asset tracking, to wholesale banking, insurance, accounting, risk management and more. That investment will continue in 2017, but the pendulum will swing back somewhat to the public blockchain space. If the bitcoin community can get its act together and solve some basic governance issues, investors will again see it as an attractive play - and with good reason. Bitcoin is still the biggest, most secure, most liquid blockchain to date. Ethereum has similar governance issues, which limit its credibility for big corporate investors, but we think Ethereum will get through those too. Prosperity - rather, the lack thereof - was behind the anger that led to the 'Brexit' vote, the Trump election, and extreme populism in countries almost everywhere. The paradox is that there is wealth creation but declining prosperity, the gutting of the middle class and, in the USA, the end of the American dream. Presidential runner up Hillary Clinton proposed to tax the rich, a plan to redistribute wealth. US President-elect Trump proposed to cut social services, lower taxes for business, restrict trade and resurrect industries like coal mining from the first industrial revolution - a plan to restore prosperity to those who had it in the early 1800s. In 2015 and 2016, we saw how such blockchain startups like Abra and the not-for-profit Stellar created mobile applications that ended the remittance rip-off, enabled entrepreneurs to pool their resources, and onboarded the unbanked to the global financial system. Inspired by these social entrepreneurs, we had an idea for a third plan, one that pre-distributed wealth, where the billions of people who currently operate outside the formal economy would own their own data and could begin monetizing it at birth. In 2017, we expect to see not only applications for establishing individual identity and protecting property rights through immutable records, but platforms for creating a true sharing economy and a government by the people for the people - all on blockchain technology. To be sure, blockchain innovators face barriers: legacy culture, bureaucracy, regulations and more than a few entrenched and deep-pocketed incumbents unable or unwilling to change. These barriers will slow progress down, but only to a degree. Satoshi has unleashed the genie from the bottle, and no one can stuff her back in. As noted, there are many impediments to the blockchain and cryptocurrency revolution. None is more important than the immaturity of the ecosystem. Blockchain technology has emerged globally as the second generation of the Internet. However, its nascent ecosystem lacks the frameworks, language, and processes required for effective stewardship of this critical resource. For example, the bitcoin community has been unable to increase block size, and the ethereum community debated for a long while about how to handle the impending removal of tens of millions of dollars from the ethereum distributed autonomous organization (The DAO). This lack of governance is in stark contrast to the first era, the Internet of Information, which had - and still has - a vast multi-stakeholder network of networks to govern the resource. This bottom-up leadership ensures that states, corporations and state-based institutions like the United Nations cannot control this new global resource. Instead, the Internet is a self-organizing set of communities. Several years ago, we studied the Internet governance network and identified 10 types of networks that keep it working. One of the most extraordinary outcomes of the digital revolution, the rise of the global civil society, and the emergence of business as a pillar of society, is that multi-stakeholder networks can help solve global problems and even govern global resources. We launched the Global Solution Networks (GSNs) Program five years ago to explore this gap in knowledge and to study the definition, differentiation, and impact of these emerging multi-stakeholder networks for solving global problems. These non-government, Internet-enabled collaborations of companies, states, non-government organizations and social stakeholders are using the Web for good, and demonstrating the power of networks to solve problems too intractable for traditional institutions. GSNs are global experts and network leaders who developed a taxonomy of 10 essential network types and studied the technologies, stakeholders, and governance of hundreds of these networks and the orchestrators driving them. The program documented new models of governance and problem solving that were impacting global challenges including climate change, pandemics, depleted natural resources, violence, and income inequality - problems that transcend national boundaries. We conducted 40 projects overall. These networks continue to govern the first generation of the Internet. Global standards networks such as the Internet Engineering Task Force (IETF) and the World Wide Web Consortium (W3C) help to maintain integrity in the system. ICAAN is an operational and delivery network that conveys domain names. There are policy networks like the Internet Governance Forum (IGF) and advocacy networks like the Electronic Frontier Foundation (EFF). There are networked institutions like the World Economic Forum (WEF) that are working hard to keep the Internet open, robust and viable. We need an ecosystem like this to steward the blockchain as a resource. Although blockchain technology emerged from the open source community, it quickly attracted many stakeholders, each with different backgrounds, interests and motives. Developers, industry players, venture capitalists, entrepreneurs, governments, NGOs and other civil societies have their own perspectives, and each has a role to play. There are early signs that many of the core stakeholders see the need for leadership and are taking steps to address it. Until now, industry players have focused largely on building their own companies. Context has become critical. Many factors can slow, impede and derail this revolution: governments can mess it up; we may fail to come up with sensible standards; we may fail to do the research needed to ensure deep penetration of this technology into various industries; repressive regimes may ban the technology altogether. In 2017, we need to get our act together. In 2017, we need to get our act together. Decentralization is critical to this technology and to the future of civilization. But decentralization does not mean disorganization. So we resolve to focus on governance in the new year. We achieved this for the Internet's first era. Now is the time to steward the second era effectively. Nothing so powerful as an idea whose time has come (again)! - A major central bank will live test a digital fiat currency and it will work, very well, leading to broader adoption. - Large banks will begin shifting large amounts of over-the-counter (OTC) transactions to real-time settlement on private distributed ledgers. Look for JP Morgan, Goldman Sachs, Barclays and Santander to lead the charge. - Incumbent companies in every industry will begin developing a blockchain strategy, hiring key IT talent and launching pilots - for sure, insurers, healthcare providers, music labels, defense contractors and others. Deloitte and IBM are good examples of this. - Bitcoin will hit $2,000 (that's right: one bitcoin will be worth $2,000). Ethereum will not collapse, post-DAO, but will become a dominant platform for new apps and new business models. There will be other distributed autonomous enterprises, and they will work as designed. - A new round of startups will enter this space in virtually every industry, particularly a new class of platform and middleware companies. From what we've seen, the innovation may well be stunning. - The crisis of legitimacy of democracy (as evidence by the recent US election) will accelerate the development and sandboxing of new e-voting systems and new platforms for accountable democracy emphasizing the use of smart contracts. - Blockchain Revolution will continue to be a global best-seller, in multiple languages, and make the New York Times non-fiction list. In January, we are launching what we hope will be the definitive research study on the impact of blockchain on business. We are staffing up our team with the world's leading thinkers and tackling seven verticals: financial services, healthcare, retail, manufacturing, telecommunications and media, technology, and government. We are also looking horizontally at the functions of the enterprise, from supply chain management and human resources, to marketing and information technology. Look for more announcements soon. Also in January, Alex's company, Northwest Passage Ventures, is launching its first blockchain fund. We both continue to do our part to move this ecosystem forward. In 2016, we launched the Muskoka Group with the mission of promoting ecosystem health and empowering the nascent governance ecosystem. We are currently conducting a project to outline some sensible steps forward. We are inventorying the players, categorizing them according to the GSN Hub (see graphic), and identifying deficiencies in the ecosystem. In March, we will be releasing our findings and making recommendations to all stakeholders about how to overcome these deficiencies and build an effective ecosystem. Also in March, we will launch an online Blockchain Ecosystem Hub sponsored by some of the most important international organizations. The hub will provide important governance know-how for the Internet's second era. In addition, Alex will continue to contribute as a member of the World Economic Forum's Global Future Council on Blockchain. And of course, we will both be on the road in 2017 launching into new exciting markets such as Korea, Thailand, Japan and several new European and Latin American countries. This article originally appeared on Coindesk as part of their "2016 Year in Review." 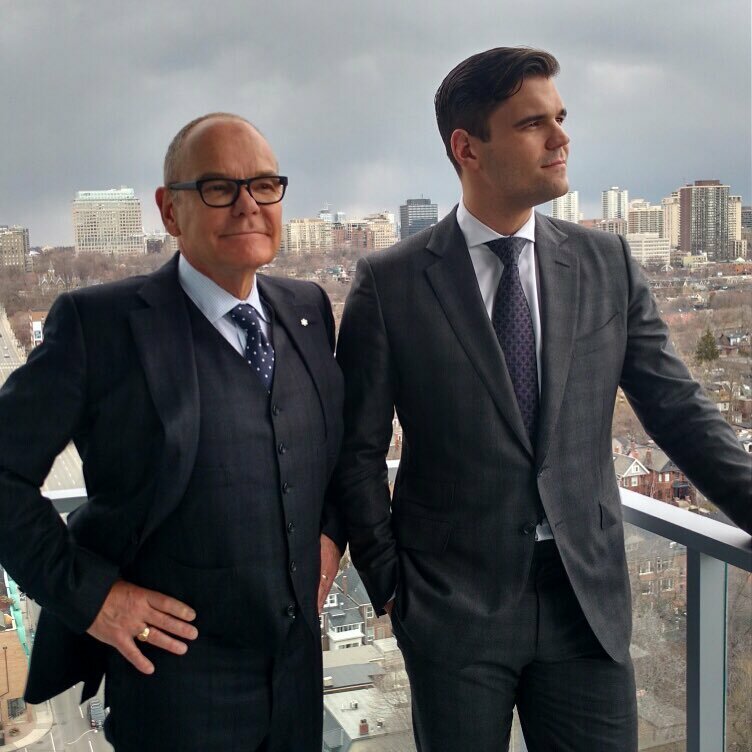 Don Tapscott is the author of 15 books, Chancellor of Trent University in Peterborough, Ontario, and CEO of the Tapscott Group in Toronto. Thinkers 50 ranks him as the No. 4 most important living business thinker. Alex Tapscott is founder and CEO of Northwest Passage Ventures, an advisory firm in Toronto helping fund and accelerate new companies in the blockchain space. They are the authors of "Blockchain Revolution: How the Technology Behind Bitcoin is Changing Money, Business and the World" (Portfolio, 2016).